If you follow True Romance Weddings on social media, you may have spotted last week that I found "the one"! After some unpleasant dress shopping experiences back in June, I had pretty much resigned myself to getting a dress made as I struggled to find one that incorporated all of the elements I wanted. I was still keeping an eye on the collections, and when browsing through the range held by My Fair Lady Bridal in Castleblayney in Monaghan I spotted one that *might* work. I called and made an appointment, and drove two and a half hours the following Monday with my nine month old in tow. Zita was there to help me and had the dress waiting for me to try on. It's stunning, and I can't wait til it arrives next year. Of course, I can't go into detail as I want it to be a surprise for my fiance, but I will show you the dresses that almost made the cut. I had my eye on this one for a while, having seen it online I fell in love with the ballerina length, glistening details and champagne colour. It was gorgeous when I tried it on, but it had been discontinued and the sample wasn't available in my size. I also knew a friend of a friend who had worn it for her wedding in the last few months, so that put me off a bit. From the current collection, I didn't expect this one to love this one as much as I did. It was definitely a lot more "bridal" than the previous one, and the tiered skirt was light and airy while still being a real showstopper. The only thing about this dress was the traditional white colour, which I didn't really want. Now this is a wedding dress! It's actually the very first one I tried on when I visited the Paloma Blanca trunk show at Wedding Boutique in Galway. 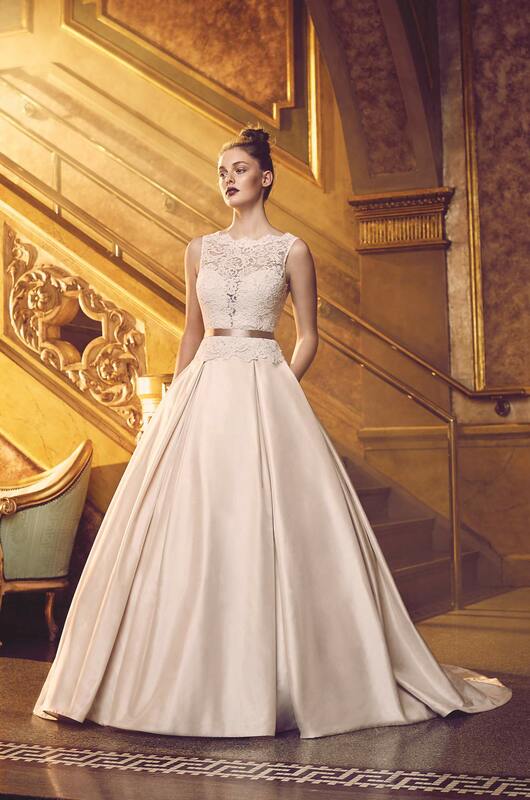 This gown has a serious wow-factor, with a heavy dupioni silk skirt and lace bateau neckline top in a rich champagne colour. I adored the colour of this gown and the skirt definitely had the drama I wanted for our castle wedding, and lo and behold even my mother liked it! This particular one was outside of my budget unfortunately but I have no doubt it will fly off the rails when it comes in this autumn. This one came very close on the colour in a soft blush tone, but not on the shape. The skirt wasn't full enough for me, and I decided that I needed something with more drama. This was the one that almost threw me when I picked out 'the one'. After travelling that far I had to try on a couple of the other gorgeous gowns at My Fair Lady, and this was one of the three we picked out. It had a stunning structure, and it absolutely sparkled - definitely enough drama for a castle wedding. I had a moment of being torn between this and my dress, but, in the end, I knew that the higher neckline on this one would end up bothering me as the day went on. I don't like things being up near my neck, and if I was feeling anxious or if it turns out to be a particularly hot day, this wouldn't be a good choice. I'm so happy with the choice I made - it has elements of a lot of the dresses above and I truly can't wait to wear it! Next job - find the shoes!